Is NATO going to survive? 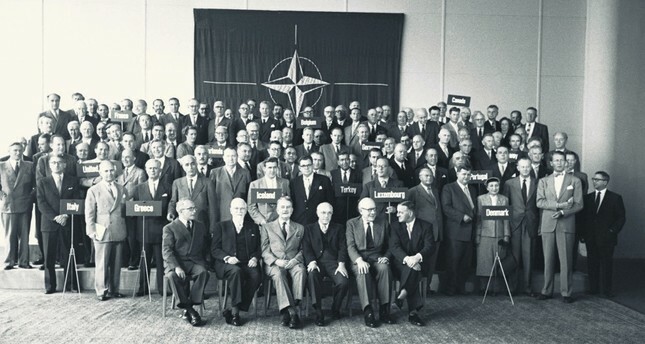 NATO parliamentarians pose for a photo in the first NATO Parliamentarians’ Conference, later known as the North Atlantic Assembly, Paris, France, July 18, 1955. As the70th anniversary of the alliance nears, discussing the future of NATO is now a timely exercise. When NATO was established in 1949, it was assigned three main functions to fulfill, to keep the United States in, Germany under and the Soviet Union out of Europe. Faced with an existential communist threat to the East, the United States, the architect of the postwar-era liberal international order, decided to boost the security and economic resilience of the West by midwifing multilateral organizations of a different kind in Western Europe. Rather than bilateralism, multilateralism shaped the American way of dealing with Western European countries. The American military presence in Europe would be considered more legitimate within multilateral security platforms. NATO and the European Union have long been considered the two most important institutional linchpins of the Western international community. Bringing the liberal-democratic capitalist states of the transatlantic area together would not only help the West defeat the Soviet menace but also facilitate an economic and political integration process among European allies by domesticating Germany. Despite the periodical crises within the alliance, in particular concerning the burden sharing debate, NATO members had united around common strategic priorities, threat perceptions and political values throughout the Cold War era. Since the Soviet Union dissolved in 1991, NATO allies have had difficulty redefining the rationale of their alliance. The most important challenge facing the alliance then and now concerns the task of finding a common strategic purpose in the absence of common enemies. Neither the transnational terrorism threat that al-Qaida and its affiliates posed nor the promotion of Western liberal values to the erstwhile communist countries of central and eastern Europe, nor the internal crises in war-torn countries lying in Europe's peripheries, nor the growing salience of such issues as immigration, organized crime, trafficking in drugs and piracy seem to have replaced the Soviet threat as the glue tying all the NATO members to each other through unbreakable bonds.Nevertheless, for about 20 years, since the onset of the post-Cold War era, the majority of Europeans concluded that the post-modern heaven in Europe had proved its resilience and become a role model for other regional integration processes, while a growing share of the American public subscribed to the view that the United States had become the indispensable nation and the most powerful country on earth, and that no one could dare challenge its primacy. Besides, the gradual replacement of postwar generations in both shores of the Atlantic by millennials, who are more inclined to take the peace dividends of the globalization process for granted, is likely to hollow out the alliance from within. The power of security elites within the Alliance, in particular the United States, who had firsthand experience with the horrors of the World War II and the psychology of the mutually assured destruction of the Cold War era, has been on the decline. New elites in the United States have been looking to the Pacific as the new epicenter of global politics; whereas their European counterparts are focusing their attention on salvaging their post-modern peace project in the face of new-age challenges. That is to say, NATO has not been front and center in transatlantic politics for some time. Against such a background, the last decade has witnessed five important geopolitical developments of which three might help potentially rejuvenate the alliance; whereas two might further dilute its cohesion and legitimacy. To start with the developments that might offer NATO members new justifications to rejuvenate the alliance, one could mention the resurgence of Russian revisionism in and around Europe, the growing Chinese challenge to the primacy of liberal international order across the globe and the negative consequences of the lack of good governance in the majority of the Middle East and North Africa (MENA) region on European security. Despite the fact that there is not a common view within the alliance on the nature of the challenge that Vladimir Putin's Russia poses to the transatlantic security environment as well as how to deal with it, Russian assertiveness in Ukraine and the Middle East seems to have led NATO allies to conclude that today's Russia is living in the age of 19th century balance of powers politics and considers the use of military means to secure geopolitical ends. NATO summits convened over the last decade attest to the fact that deterrence and reassurance have once again become vital to the preservation of the alliance. Despite critical rhetoric of the current American administration, American military presence in Eastern Europe has increased and NATO allies now conduct more military exercises than ever since the early 1990s. Russia's political meddling in western democracies and increasing reliance on cyber-warfare tactics seem to have united the allies around the common purpose of redesigning the alliance as a bulwark against potential Russian threat. The negative consequences of the post-Arab Spring developments on European social peace and economic prosperity are also well-documented. For European allies to deal with the challenges of terrorism and immigration, which one can confidently relate to the developments in the MENA region, cooperation within NATO has once again proved to be of vital importance. What is unique about the threats posed by Russian revisionism and developments taking place in the MENA region is that such threats endanger European interests more decisively than American ones. It is Europe, rather than the United States, that should see NATO vital to its security interests in the context of Russian policies and developments in the MENA region. This is also to say that if the European allies want to see the United States still feel committed to the alliance and help Europeans meet such challenges successfully, they should increase their military contributions to the alliance budget and undertake more security responsibilities than ever. On the other hand, China's spectacular rise is the particular geopolitical development that will impact the future of the alliance most profoundly in the years to come. Despite the fact that Americans tend to interpret China's ascendancy from geopolitical and geostrategic lenses, while Europeans adopting a more economic perspective, the need to deal with China becomes more and more important each passing day. Containing China's rise has already become the number one preoccupation of successive American administrations over the last decade. There is still a long way to go for European allies to view China from a more "American" perspective. Yet, China's attempts at shaping a more pro-Chinese attitude across Europe through the adoption of Russian style divide-and-rule tactics will likely help awaken European allies to the Chinese challenge. Unlike the Russian and MENA challenges, the Chinese challenge seems to preoccupy the United States more than European allies. That is to say that if the United States wants to see European allies adopt the American perspective on China and help contain the rising dragon, it needs to reassure them of America's commitment to European security. All this suggests that NATO will be around because Americans and Europeans will continue to benefit from it, though for different geopolitical reasons. The factors that could on the other hand contribute to the erosion of the cohesion and legitimacy of the alliance are the growing neo-isolationist trend in the United States and the rise of populist and nationalist currents across Europe. Starting with former U.S. President Barack Obama and continuing apace with current President Donald Trump, the American public has gradually adopted a more skeptical attitude toward the liberal internationalism of the postwar era, and the United States acting as the sole global security provider. When this is combined with Trump's nativist nationalism, one could even argue that the NATO membership of the United States can no longer be taken for granted. Whether or not Trump is using the "leaving the Alliance" threat to nudge European allies to invest more in their armies, his misgivings about the liberal international order is likely to have a corrosive impact on NATO's future. When the possibility of Brexit is combined with the growing salience of illiberal populist political movements across the European continent, NATO's future becomes much darker. Though the United Kingdom's membership in NATO will not be affected by its exit from the European Union in a technical manner, Britain's departure from the EU will likely endanger the psychological bond between London and other European capitals. Continental Europeans have already given strong signals that post Brexit European allies would look more to the EU than NATO in finding solutions to their security problems. The jury is still out on NATO, and time will tell if the transatlantic allies would be able summon the will and courage to adapt their time-tested alliance to the emerging geopolitical realities of the new century.